Peace and justice movement applies for permits, announces march route for protest at Democratic National Convention | Fight Back! 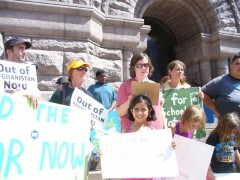 Minneapolis, MN - At an Aug. 9 press conference in front of Minneapolis City Hall, leaders of the Twin Cities peace and justice movement announced the route for the massive anti-war march that will take place if the Democratic National Convention (DNC) is held in that city. Activists had the march permits in hand, ready to be presented to city officials. “I’m here today to say that if the Democrats choose Minneapolis for their 2012 convention, MIRAc will mobilize again to protest. Why? We must protest, because the unjust wars abroad in Afghanistan and Iraq continue. 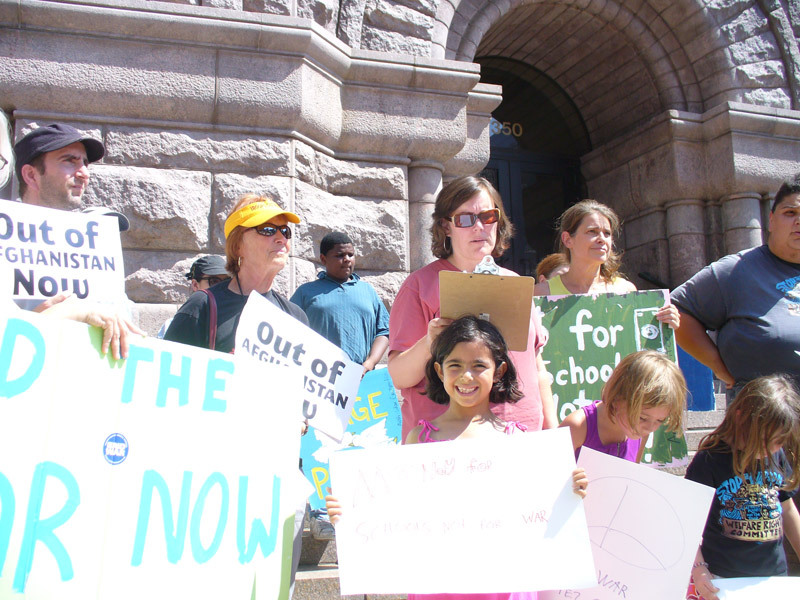 And we must protest because the unjust war against immigrants here at home continues,” said Brad Sigal of the Minnesota Immigrant Rights Action Committee (MIRAc). Many of the organizations that organized the massive anti-war protests at the Republican National Convention in 2008 are joining this effort, including the Anti-War Committee, Women Against Military Madness, the Welfare Rights Committee and others. Protest organizers plan on a march the opening day of the DNC that would start in Loring Park, proceed to the Metrodome - the proposed site of the DNC - and would then proceed to Elliot Park. “We are not going to put up with the city of Minneapolis dragging its feet on granting us permits for a march at the DNC. We went through that with the 2008 RNC march permits in Saint Paul, and we will not accept something like that a second time. Under the slogan ‘Money for human needs, not for war,’ we will take thousands of protesters to the Metrodome if the DNC is held here,” states Deb Konechne of the Welfare Rights Committee.